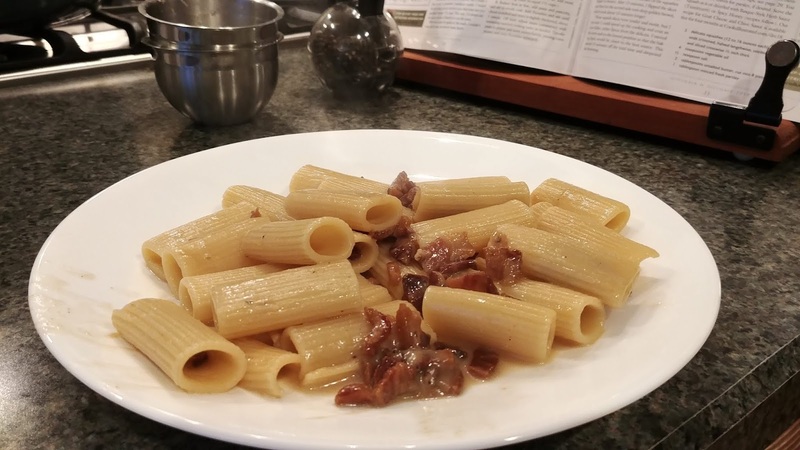 The November/December 2018 issue of Cook's Illustrated has a recipe for Rigatoni alla Gricia, pasta with pancetta & pecorino romano. 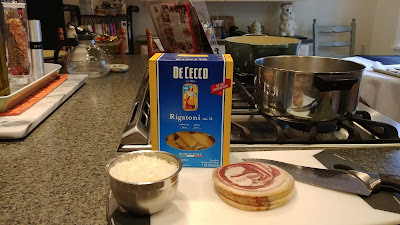 We both had an interest in trying it since it was similar to some other dishes we've made and we wanted to compare. 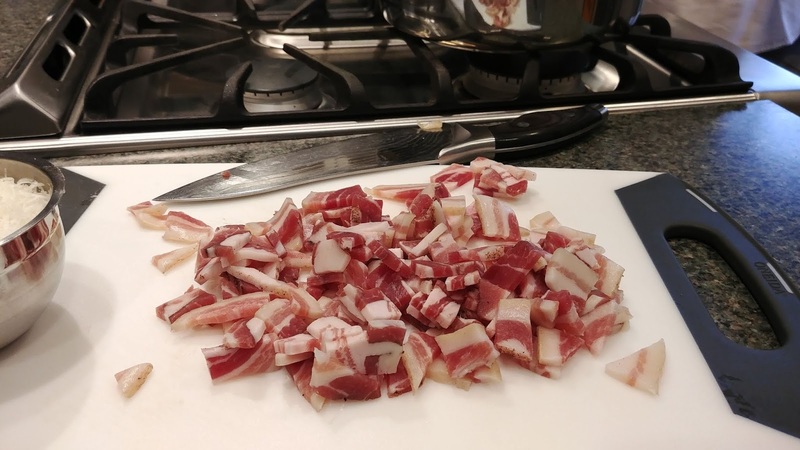 Traditionally, guanciale is used in this dish but pancetta works well. The ingredient list is short: rigatoni, pecorino romano, pancetta, olive oil, ground pepper. 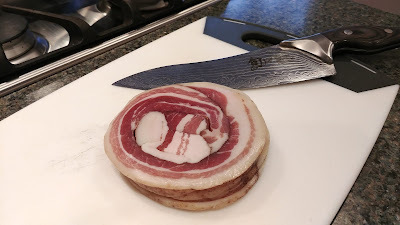 Pancetta rounds from Market District, sliced 1/4" thick as the recipe says. The rounds cut into rectangular pieces (about ½ inch by 1 inch). 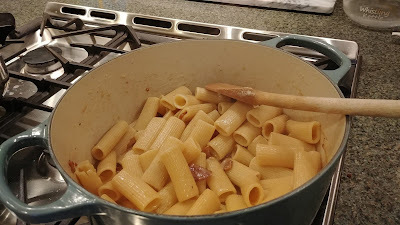 Pasta and pancetta in our Dutch oven. That's where the photos end! I thought we took more, but we didn't. This dish is super easy: cook the pancetta until golden brown, drain and reserve fat, cook pasta, drain pasta, reserving some pasta water. Add pepper and reserved fat & water to Dutch oven & cook until they are emulsified and reduced to about 1.5 cups, add pasta and pancetta, stir together, add cheese, mix together until the sauce is creamy, eat & enjoy. I liked this dish, but I didn't love it. It's very rich. I'm glad we had arugula on the side because I really needed something like arugula to cut through the richness and saltiness (from the pancetta and cheese). I ended up mixing my arugula into the pasta. I also added a lot more fresh pepper to my pasta. SP felt the same - it was yummy but a bit much. 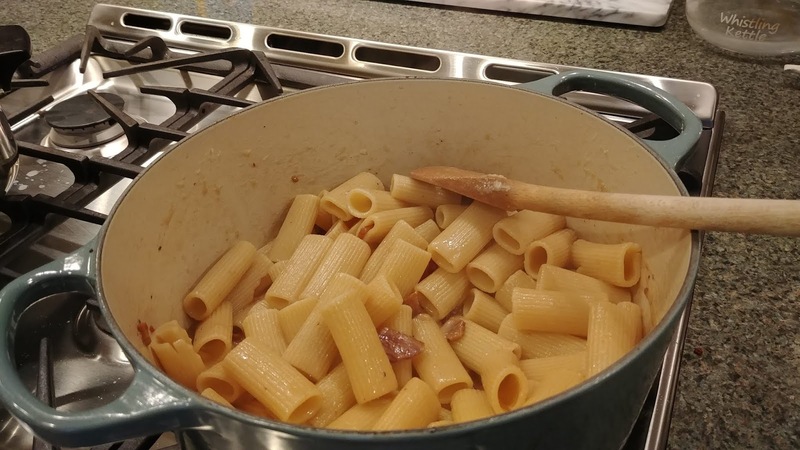 I'm not sure we'd make it again because there are other pasta dishes we like more than this one, but it is a quick and easy dinner meal. We made the full recipe and got 3-4 meals from it. We reheated it with the casserole dish lid on to keep it from drying out. You could always keep some extra pasta water in the refrigerator to add when reheating it. We didn't add any extra liquid and thought it was fine.